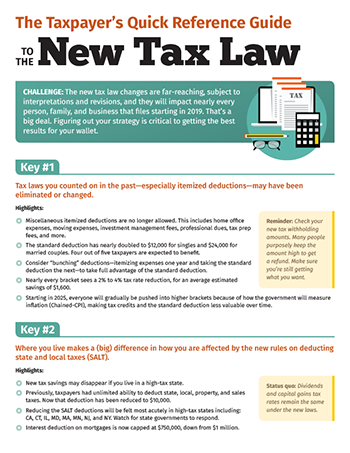 The New Tax Law Reference Guide — Eastern Planning Inc. The new tax law changes are far-reaching, subject to interpretation and revisions, and will impact nearly every person, family, and business starting in 2018. That's a big deal. Figuring out your strategy is critical to getting the best results for your wallet. Sign up for your FREE taxpayer's quick reference guide to "The New Tax Law" now!